Some of my friends know I'm a decent fan of David Sirlin. I think his book Playing to Win: Becoming the Champion is required reading for people who want to seriously compete. It's taken a while, but I've convinced my local game store to get Yomi & Puzzle Strike from him. I spent a good amount of time over the past weekend playing both games with some friends there, and I have to say they're both very interesting. 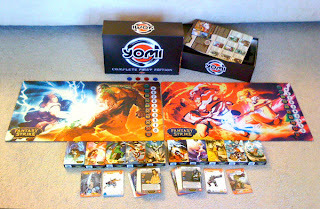 Yomi is just as good as I expected, while Puzzle Strike still kind of eludes me as to exactly what it really expects us to do (I know how it works, but the issue is finding how to play it well).